This Booklet contains a wealth of information which Anne has painstakingly gathered making the history of the island, as told by these stones, most accessible. As Anne says in the foreword: “There are some interesting stones in the graveyard ranging from flat stones carved with figures and symbols to inscribed stones bearing cherubs and celtic designs. The decorated flat stones are of considerable historic interest. Fourteen have so far been identified which date from 14th to 16th centuries. These can be found in the graveyard, inside the church and one is in the museum. As they have no inscriptions they are outside the scope of this booklet”. One of the motivations for putting the book together was the fact that some stones are becoming so weathered it is no longer possible to read them and for this we must be very grateful to her. This is the book’s 2nd edition and was published in 2009. 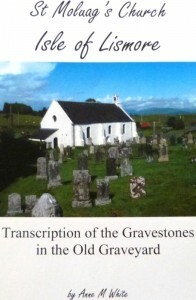 It is available in the shop at the Lismore Gaelic Heritage Centre.